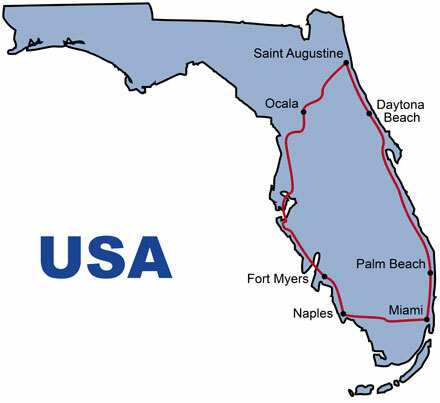 This 7 day KeaRider motorcycle tour through Florida takes you to the most historic places in the Sunshine State. You will discover Saint Augustine, the oldest European settlement in Florida, will have a race horse farm visit in Ocala, the horse capital of the world, visit the former summer residence of the great inventor Thomas Edison, which is now a museum in Fort Myers, and stop at the Kennedy Space Center, where space history was written. A further highlight is a visit in the world's largest Harley-Davidson shop in Daytona Beach. Of course on this road trip stops at the most beautiful beaches, for example Sanibel Island are scheduled. After an individual journey, tour participants meet in Miami, where you will hit the road the same day. First stop are the famous Everglades, where you can take a ride with an airboat, before you continue on to the Gulf Coast. After spending the night in Naples, you will experience the picturesque seaside resorts of the Gulf Coast on the way to Sanibel Island and Fort Myers. Today you will cruise along further up the Gulf Coast and reach via Sarasota and Anna Maria Island the town of Weeki Wachee, where you can visit the famous Mermaid show. Accommodation is in Ocala. In the morning you will visit one of the racehorse studs for which Ocala is best known before you drive through the Ocala forest, and ride past the Saint Johns River along to Saint Augustine, the oldest city in Florida. In the evening you have the possibility to visit a pirate show. After visiting the Castillo de San Marcos you will leave Saint Augustine and cruise south to Daytona Beach, where you will find Bruce Rossmeyer's Harley-Davidson shop and a hotel right on the beach. A highlight for technology enthusiasts is the visit to the Kennedy Space Center on the following morning, before you continue on to Palm Beach. The last stage leads via Fort Lauderdale and one of Florida's largest shopping malls back to Miami, where you start your individual journey back home.